“I wore a muscle shirt on purpose to the audition,” says senior Eren Wolf, recounting her audition for the cast of the musical. Although she has participated in every year’s fall musical, Wolf has always been under the stage in the pit orchestra. 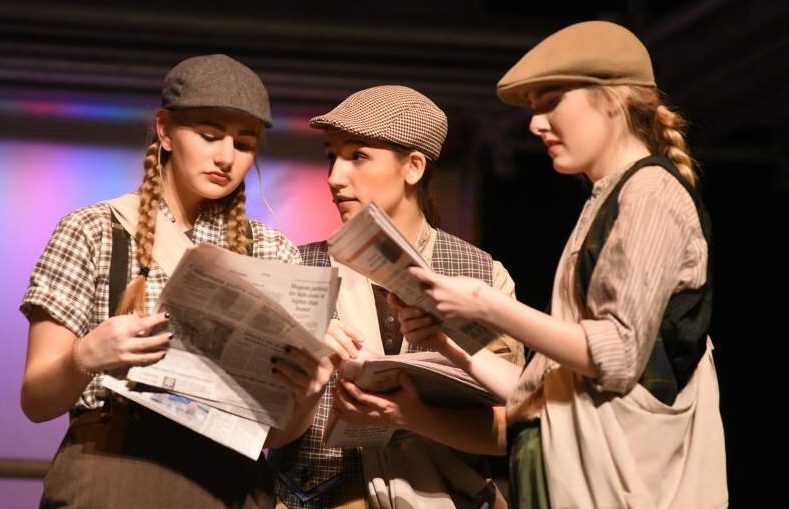 Knowing that her final year was approaching she wanted to try something new, and with the hit Disney musical Newsies coming up, what better time than now? Not only is she a talented violinist, as demonstrated by her years of experience in the pit, Wolf also is a fantastic vocalist and even has perfect pitch. After watching the dress rehearsal on Thursday, I was thoroughly impressed by the big cast and all the action that happened during the lengthy performance. 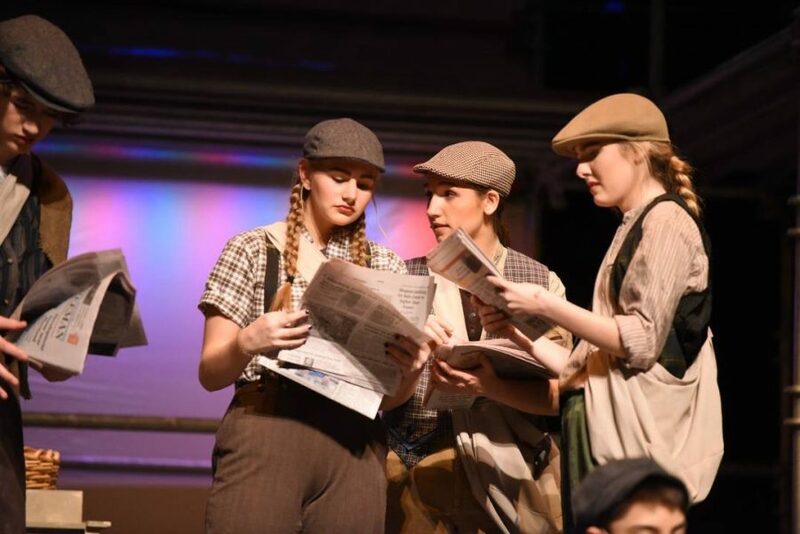 “The crew put in so much extra work to give us an amazing set…the scaffolding adds greater dimension to our stage; Newsies can explore all the levels of New York”, states Wolf as the cast runs up and down the stairs, rehearsing certain scenes. Her favorite part of the musical this year was getting a closer look behind the scenes. 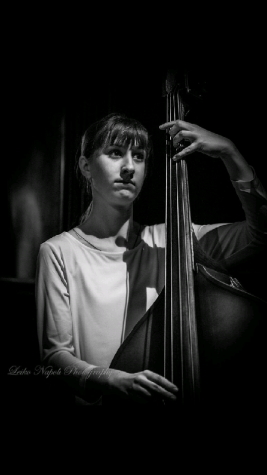 “As a former pit orchestra member myself, I understand the feeling of just being stuck under the stage and not knowing what was happening above; we would often crane our necks upwards just to get a glance of the action. She comments with a laugh that “Pit people don’t get to see what happens behind the curtain, like the cast members dancing around at the end of intermission”. While Wolf was a seasoned veteran to the whole musical process, her first year in the cast came with difficulties. In the pit all she had to worry about was making music and watching Mr. Gillette. 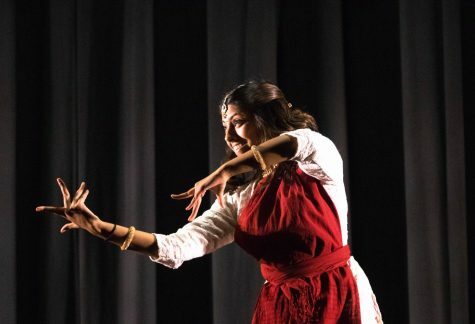 “I had to think about a lot more than just making music…being a Newsie has made me a lot more comfortable with asserting myself in a room,” she says. Even with all the challenges she faced, Wolf thoroughly enjoyed being involved in her final high school musical. “Even though I didn’t get to show off my biceps, it was truly a memorable experience”, she jokes, pretending to flex. Preparation for next year has already begun, and Wolf is excited to see what is in store for the cast, crew, and pit orchestra.